Now there is no good reason to take acid reducing pills every day. The defective esophageal valve can be reconstructed by Endoscopic Fundoplication or Videoscopic surgery. I am very happy to announce that now I will be able to help GERD patients with Transoral Incisionless Fundoplication (TIF). TIF recreates the lower esophageal valve and helps eliminate gastroesophageal acid reflux by correcting anatomic root cause of GERD, eliminating need for daily dose of PPI medications and associated long term effects and complications including kidney damage. GERD today is treated with medications such as H2 blockers, and PPIs. These medications lose their effectiveness over time. They also don’t treat the underlying root causes of reflux, the deteriorated anatomy of the antireflux barrier, requiring life-long use of these medications. In addition, recent studies on the adverse effects of long-term use of PPIs indicate a significantly higher incidence of hip fractures, particularly among women. TIF was developed to emulate more invasive surgical techniques, but from within completely eliminating incisions and visible scars. Using the FDA-cleared EsophyX device, the procedure is performed through the mouth, rather than through an abdominal incision. Typically lasting no more than 50-60 minutes, the procedure is performed under general anesthesia and reconstructs the antireflux barrier to restore the competency of the gastroesophageal junction. Most patients can go home the next day and return to work within a few days. For people who have larger hiatal hernia, Laparoscopic Videoscopic surgical intervention may be required. 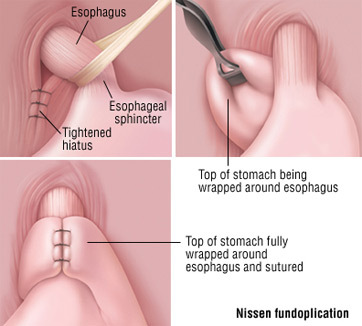 The conventional Laparoscopic Nissen Fundoplication procedure has been proven a very effective long-term solution to manage acid reflux. It includes a few small incisions for Videoscopic Surgery and patients remain in the hospital for up to 1-2 days. 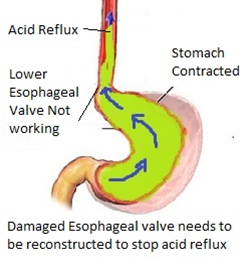 As shown at the image to the right, this procedure includes, Laparoscopic repair of Hiatal Hernia and also recreates the lower esophageal valve that stops the acid going back up and therefore there is no need to take expensive medications with serious side effects such as Nexium , Omeprazole, Protonix, Zantak, Pepcid among a few.